There is no doubt that for many software-as-a-service (SaaS) companies, a free trial is a key component of their customer-acquisition strategy. Large amounts of their marketing budgets are focused on driving leads into a free trial. Many of them will also run email nurture streams and calling campaigns in the hope that users will activate the trial and convert to customers. SaaS marketers must be able to look further down the funnel and see the impact that their free-trial marketing efforts have over the entire lifetime of the customer. To accomplish this, you can use cohort analysis, as Nick Franklin of ChartMogul has discussed in his growth-hacking course. In today's post, I'm going to share one of the most important ways that SaaS marketers can use cohort analysis to help improve their user onboarding and free-trial conversion rate. But first, here's a little background on cohort analysis in general. According to Gartner, a full 80 percent of all future SaaS revenue will come from only 20 percent of your current customers. Therefore, an increase in customer retention of 5 percent can increase your business’s profitability by 75 percent, say researchers at Bain & Co.
With payback periods (the length of time it takes to recover acquisition cost) ranging more than 12 months, ensuring that customers are retained well past this timeframe is the only way to achieve profitability. Many SaaS companies use cohort analysis to measure customer lifetime value, revenue per customer and churn to ensure their customer-acquisition strategy is effective. Benn Stancil of Mode Analytics just wrote a great piece on Cohort Analysis That Helps You Look Ahead. In it he discussed the drawbacks of temporal cohort analysis and how cohort analysis can be used to dive into acquisition trends such as user language and sign-up device type. These are clearly both important ways that you should be analyzing your user base. However, one of the best ways for SaaS marketers to understand and optimize their free trials is to break down their free trials by their different buyer personas. You're likely already familiar with the concept of buyer personas, or archetypes of your ideal customers, especially with SaaS, understanding their needs and pain points is critical to product development as well as marketing. The messaging and communication within your free trial should be customized to the unique needs of your buyer persona the exact same way your marketing messages that got them into the free trial in the first place were. Otherwise you're just shooting yourself in the foot. For example, an e-commerce company could change their free trial messaging for someone who is just starting out with e-commerce compared to someone who is an experienced e-commerce user because the key features they need to be introduced to in the platform will be entirely different. An advanced user might be more interested in the reports they can run on their store performance, while someone who is just getting started needs to be instructed on how to add a product to their store to begin with. Now that we're providing a more personalized experience to each of our personas within the free trial, Lincoln Murphy has discussed the concept of common conversion activities (CCA) as a key metric to free trial/user onboarding success to increase activation and free to paid conversion rates. This is most certainly true as it "put[s] the emphasis of the free trial on the prospective customer" to ensure that you are meeting their unique needs. With personalized free-trial experiences in place for each of your company's buyer personas, it's now time to analyze the results. This is where cohort analysis comes into play (finally). 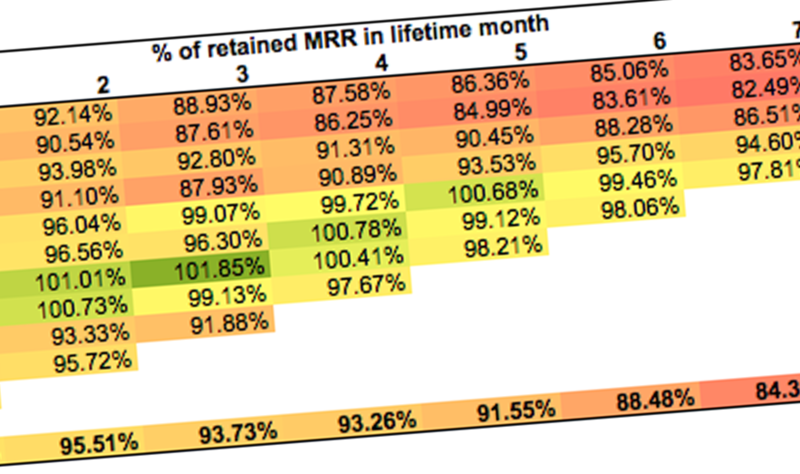 Instead of looking at a temporal analysis of your free-trial conversion rates and lifetime value, MRR and churn, you can now analyze all these different factors with a better understanding of the actual users behind these numbers. You can also see how they are converting in your trial and how valuable they are to your business over their entire lifetime. This analysis can have a profound impact not only on the effectiveness of your marketing efforts and which customers can be acquired the most efficiently, but also on your product itself and which users are finding the most value and turning into your best customers. We hope you find the template useful, and we look forward to continuing the conversation with you as your company grows. *Special thanks to Christoph Janz for allowing us to adapt his cohort analysis template to fit this buyer-persona model. You can read more phenomenal SaaS advice on his blog.